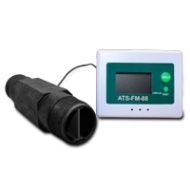 ATS’ Flow Meter series is a versatile digital flow meter used for measuring volumetric flow rate of water (only) in a pipe. It is compact in size, cost effective with an accuracy unmatched in the industry. In addition to instantaneous reading of the flow rate, it can also calculate the accumulated volume of the flow during an interval. The unit automatically turns on when there is flow rate and shuts off when there is no flow. Data saved after "power off"